Condensation heat transfer plays an essential role in the efficiency of various energy-intensive industrial technologies including power generation, energy utilization, water desalination and harvesting, air-conditioning, and thermal management of electronics. It is well known that dropwise condensation on the hydrophobic surface (Fig. 1A), where the frequent roll-off of condensed droplets, e.g. on a vertical surfaces, helps to refresh the surface that is exposed to the vapor, has an order of magnitude higher heat transfer efficiency than that of filmwise condensation on the hydrophilic surfaces (Fig. 1B). Promoting dropwise condensation by surface modification has thus been of great interest since its discovery. However, the long-standing challenge for better condensation heat transfer performance is to improve both droplet growth and surface refreshing. Compared to water-repellent micro/nanostructured materials for self-cleaning, drag reduction, anti-corrosion and anti-fogging, it is extremely challenging to create large-area superhydrophobic surfaces cost-effectively on metals with high thermal conductivity to fulfill both fluid mechanics and thermal requirements. Metallic micro-networks with interweaving liquid channels, such as copper micro-meshes and micro-foams, have been widely exploited in various industrial applications including oil-water separation and catalyst support medium due to their low cost and good scalability. These copper meshes and foams have also been used to improve liquid wicking capability for high-heat-flux boiling and evaporation heat transfer. However, the systematic study on the fundamental mechanism of vapor condensation on the woven meshes is still lacking. Ronggui Yang and colleagues from the University of Colorado Boulder, Huazhong University of Science and Technology, Beijing Jiaotong University, and Dalian University of Technology, presented a superhydrophobic hierarchical mesh-covered (hi-mesh) surface to enable continuous sucking flow of liquid condensate (Fig. 1C), which sustains enhanced condensation heat transfer performance, under very large surface subcooling. This work, entitled "Sustaining enhanced condensation on hierarchical mesh-covered surfaces", was published in National Science Review (Natl Sci Rev 2018; doi.org/10.1093/nsr/nwy098). In this work, commercially available copper woven meshes are used as the starting materials. The typical structural features of the hi-mesh surfaces are formed by bonding a woven copper mesh onto the plain copper substrate (Fig. 1D). High-density knife-like copper oxide nanostructures are formed on all the exposed surfaces of the substrate and mesh wires (Fig. 1E), which serve as nucleation sites for droplet formation and growth. During vapor condensation, the nucleated droplets on the substrate rapidly grow and coalesce to form a thin liquid film in the interconnected channels between the substrate and woven mesh layer. When small droplets growing on the mesh wires merge with the thin liquid film, they can be efficiently removed by being pulled into the liquid film, accelerating surface refreshing for droplet re-nucleation and growth on the mesh wires. With continuous droplet-to-film coalescence, the interweaving channels can be filled with liquid condensate. Once the liquid film overcomes the Laplace pressure and grows out of the woven mesh layer, the surrounding liquid film can be continuously drawn out in the form of gravity-driven falling droplets, resulting in rapid surface refreshing (Fig. 1F). By coupling the high-performance dropwise condensation on mesh wires and thin liquid film condensation in the interweaving channels, the sucking flow condensation outperforms both filmwise and dropwise condensation heat transfer performance (Fig. 1G). This work significantly advances the field of condensation heat transfer enhancement including the scalable-manufactured materials, novel liquid removal mechanism, and unprecedented heat transfer enhancement. 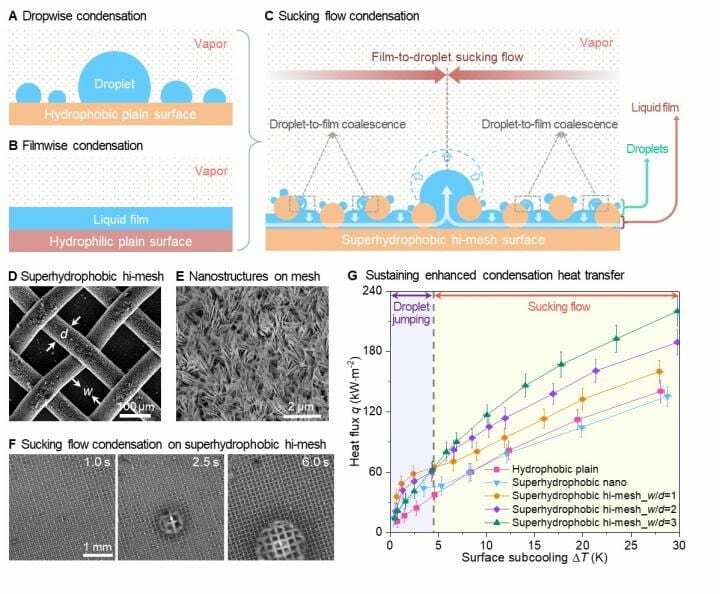 In particular: 1) a superhydrophobic hi-mesh surface that can be scalably manufactured is fabricated using low-cost commercial meshes; 2) a novel sucking-flow liquid removal mechanism is demonstrated to promote both surface refreshing and droplet growth; 3) Unprecedented condensation heat transfer enhancement is demonstrated over a wide range of surface subcooling, compared to state-of-the-art dropwise condensation on other micro/nanostructured surfaces. The demonstration of sustaining enhanced condensation on the hi-mesh surfaces is not only of fundamental scientific importance, revealing the novel sucking-flow enhanced liquid removal; it also tackles the long-standing challenge in pushing micro/nanostructured materials into the practical applications. Bridging the gap between the water-repellent surfaces and high-performance phase-change heat transfer processes, such low-cost hi-mesh surfaces are readily available to be deployed at scale for a wide range of energy and water applications including power generation, water harvesting and desalination, air conditioning, and thermal management of electronics. This research received funding from the financial support from the USDA National Institute of Food and Agriculture.